First of I am going to mention gift cards, I used to believe that this was the easy way out so you didn't have to put much thought into it and look for something but now as I have gotten older I have really come to appreciate the little gift card. It can really be hard finding the perfect gift for someone and specially if they are picky or they have everything. Do not underestimate the gift card in a pretty Christmas card or envelope it will allow the person to actually use it for what they actually want. 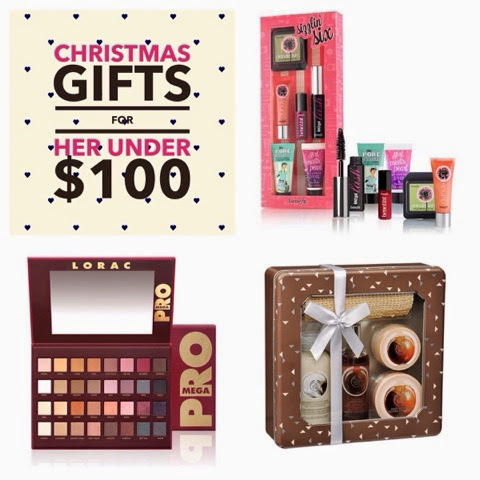 Now I'm not going to list heaps of beauty gift ideas because this would be a huge post as there are so many great gift sets out at the moment that are great value for money and would put a smile on a beauty lovers face. Here are a few that I have been loving. The Body Shop Tin of Nuts $49.95 (The Body Shop) - These tins are a great way to try everything and get a variety of items and coming from the body shop they will smell divine and please pretty much anyone. 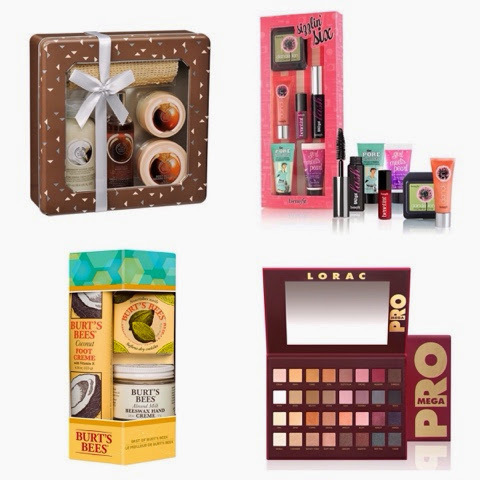 Benefit Sizzlin' Six Mini Set $42.00 (Myer) - This cute pack of mini Benefit goodies will impress the beauty lovers in your circle. First of they are mini so they are adorably cute and practical for traveling and trying out the products. Burt's Bees Best of Burt's Bees $29.95 (Myer) - This set contains a coconut foot crème, almond milk beeswax hand crème and one of my personal favourites the lemon butter cuticle crème. This pack would be great for anyone of any age and is filled with some great products. Lorac Mega Pro Palette $89.99 (MYQTY) - Now for the avid beauty lovers this palette has been on a lot of wish list I have seen lately (and on mine as well) you can pick this baby up at www.myqty.com at the moment and would make any girls Christmas. Now for the fashion sort of side I have picked out a few of my favourites that I have seen around. A Sentence a day Gift Pack $29.95 (Kikki K) - For my stationary lovers this little pack contains a sentence a day journal, mini calendar, stamp set and a ballpoint pen all beautifully gift wrapped. 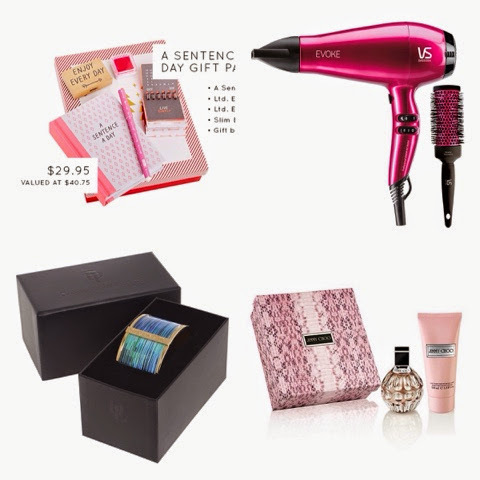 VS Sassoon Evoke AC Hair Dryer $55.96 (Myer) - This pretty pink hair dryer is self explanatory and it caught my eye when I was looking for a new hair dryer so I think this will be added to my wish list also. David Lawrence White Noise Bangle $51.75 (Myer) - This bangle looks absolutely gorgeous I'm not usually big on jewellery but this bangle has made it to my list and anyone that loves fashion and jewellery really should have a look at it. It also comes beautifully boxed great for gift giving. Perfume Sets - Too many to list they are a great gift if you know the scent the person your gifting to wears or also the mini sets that have all different ones so they can try out and see what they like. They all range in prices and can be picked up pretty much everywhere. 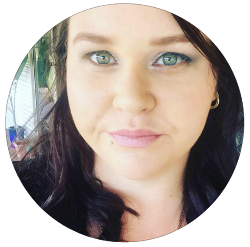 For that something different I have included a few more items that I personally love and that are not beauty or fashion related. Thoughtful Gardener Hand Trowel & Fork $64.95 (Myer) - For the Gardener of the family this pretty little set would be a great idea they come in handy all the time and they look stylish as well. Karen Walker Champagne Glasses $49.95 (Myer) - I love these, I really love gold and champagne so it's a win win haha but they just look so stylish and high end but with a reasonable price tag. These a great gift if someone has just moved into there own home or for the ladies that have everything. 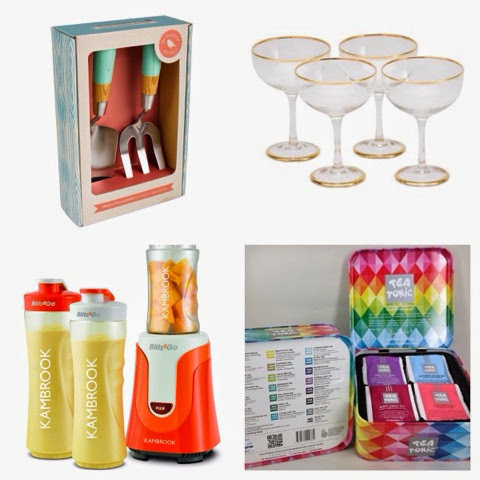 Kambrook KBL63 Blitz2Go Personal Blender $49.95 (Myer) - For the smoothie lovers out there this little blender is awesome you can make and drink your smoothie out of the same bottle so less washing up YAY but it is compact and easy to store and clean. Tea Tonic Tea Chest $27.00 - $45.00 (Tea Tonic) - For the Tea lovers these tea chest would make a beautiful gift it has a variety of the Tea Tonics teas and give the person a chance to try them all and see what they love (I personally love the coconut tea). They come in this colourful chest so they are nicely packaged and ready to be gifted. 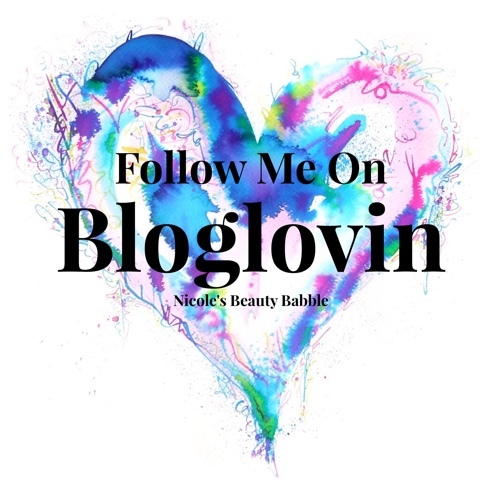 Well that is it for me I have rambled enough for one post, I could go on and on about gift ideas as there are so many great deals and sets out there at the moment. There are some amazing ideas in here. I love how you've given so much variety! I am working on a post this week about gifts for her & him for Christmas and you've given me lots of inspiration! I love the sentence a day for Kiki K!